Will Champlin just released his new record of 13 songs with special Live features included. Will offers us very mature songs he co-wrote for the major part with Tamara Champlin, Bill Champlin, Michael Caruso and J. Storm. Tim Pierce brings his amazing guitar work on several songs. Tracklist is California, The answer, Pocket Call, Now that we're fallin', Timebomb, Back to yes, Breakin the rules, Downtime, Red Handed, One World, Forget 2 breathe, Fall like Rome and Something tells me. Born and raised in Los Angeles, CA. - in addition to being exposed to music and the music industry since birth. At the age of 21 years old Will Champlin holds his own among an industry of giants. Will is an ever-evolving multi-talented artist. As an accomplished and versatile piano player and Attended the Berklee College Of Music in Boston MA. Some of Will's greatest musical influences are: Stevie Wonder, Billy Preston, Bruce Hornsby, as well as many others. Will’s father, Bill Champlin, has been a lifetime member of the infamous rock band CHICAGO. In 2006, Will toured extensively as Frontman and Lead Singer for The Salvador Santana Band - opening for Carlos Santana and The Los Lonely Boys in major concert venues across the U.S. The band Orleans is pleased to announce both the release of their new Obscurities CD. "Obscurities" is a collection of 13 never-before-released STUDIO tracks (from '77 to '08) to add to your Orleans collection. Unlike their "Still the One: Live - 30th Anniversary" Retrospective, which culled it's gems from their personal vaults of concert performances, "Obscurities" gets its juice from their secret stash of ALL STUDIO CUTS! Terry Haggerty and friends "First take"
Terry Haggerty (Sons of Champlin), Gary Novak and Dave Carpenter released that record "First take" as a trio, making it up in the studio and grew into a bit more of a collaboration with Don Grusin, Scott Kinsey and Brandon Fields. If you like amazing guitar instrumentals... this cd is a must have! MANDOO, a group made in France, made in Soul, to discover! Mandoo was born under the impulsion of Pierre Vanier and Esther Ben Daoud, a duo both on stage and at home. One is a bassist and a singer, the other is a pianist and an arranger. They played together for several years in diverse jazz, pop or rock groups. In 2003, they decided to be the masters of their own fate and created their own group. First a sextet inspired by the soul-funk American repertoire, the group progressively evolved along a more personal line. After several changes, Pierre Vanier, Esther ben Daoud and Fabio Marchesan, a guitarist and lifelong friend, invited drummer Moussa N'diaye (Tarace Boulba), saxophonist Olivier Laudrain (Mory Kante), trumpeter Vincent Payen (Cabaret, Alpha Blondy) and Audrey Lesieur (Lyrics writer) to join them. As years go by, Mandoo's experiences and collaborations keep increasing. They play in all Parisian clubs (Etage, Balle au bond, Belvédère,...), give one concert after the other in the Club Med villages in France and abroad (Athenes, Marrakech, Kemer...) and for professional events. At the end of 2007, the group got into a studio to record their first five titles at PFL Studios with Xavier Duthilleul and Pascal Santos (Minu Cinelu). Frontiers Records is excited to announce the European release of Tall Stories’ second album, “Skyscraper”, on January 23rd. Tall Stories first rose to prominence upon the release of their self-titled debut album in 1991. At the vocal helm is Steve Augeri who previously provided the lead vocals for Journey, following Steve Perry’s departure from the band. Formed by Augeri with Jack Morer on guitars, Kevin Totoian on bass, and Tom DeFaria on drums, Tall Stories represents a group of musicians who were exposed and inspired by such diverse sounds ranging from: Blues to Rock, Funk, Punk, Country and Reggae. As a result, their music isn’t typical of the standard rock genre. Signed by Bud Prager’s ESP Management (Foreigner, Bad Co., Mountain, Damn Yankees), Tall Stories’ first album was produced by Frank Filipetti (Deep Purple, Kiss, Foreigner). While the musical climate in the United States in 1991 was going through a metamorphosis of its own, Tall Stories’ debut album was a breath of fresh air in the melodic rock scene at the time. The band’s unique musical core immediately became a sensation with rock fans and critics alike. A tour with Mr. Big followed, but despite the great response from fans, the evolving musical climate forced the band to take a step back and hibernate during that period. Steve Augeri went on to join Tyketto and then Journey but, along the way, the band continued to collaborate and write songs, while waiting for the right time to regroup as a band. Tall Stories’ rebirth offers its fans the opportunity to partake in what would be the band’s second chapter. Due to schedule conflicts, Tall Stories hired a handful of stellar guest drummers to complete the picture. First, the talent of Rodney Howard (Avril Lavigne) contributed to “Stay” and “No Justice.” Then the legendary Bobby Rondinelli (Rainbow, The Lizards) on the bombastic “River Rise.” And last but not least, Nir Z (Genesis, Chris Cornel) on “Original Sin,” “Eternal Light,” and “Pictures of Summer” to name a few. Produced by guitarist Jack Morer, Skyscraper stays true to the genesis of Tall Stories: music and songs that are as melodically rich and diverse as the band members themselves. From the opening track, “Tomorrow,” an uptempo song reminiscent of U2 and Led Zeppelin, to the final song, “You Shall be Free,” a Gospel number in every sense of the word, the new album is a musical tapestry of different colours and textures. Blake Shelton's new album "Startin' Fires"
With the success of his 2008 chart-topper "Home" (written by David Foster), Blake Shelton took a long career step forward. With the release of Startin' Fires, he leaps to a whole new level. "Home" took Shelton into new musical territory, stretching him vocally and stylistically, helping him expand his audience to include those who might have missed the more traditional approach he'd taken to that point. Startin' Fires, his fifth album, completes that journey, establishing him in the process as one of country music's most talented and versatile song stylists. "This is something I've been wanting to do," he says, "exploring richer melodies and challenging myself as a singer." Blake's stature as a singer has grown steadily through the years, and his presence everywhere from network television to Youtube has raised his profile even more. Now, with the release of Startin’ Fires, Blake steps into the forefront as both one of the country’s premiere vocalists and one of its true personalities. Long awaited 2008 debut album from the teenage Filipino singing sensation (full name: Charice Pempengco). From youtube.com to Oprah and Ellen, Charice's amazing voice has enchanted millions of new fans all over the world. The album is a bit overdue, held back by a busy schedule that saw her traveling to Sweden, Korea, the United States and England, as a sought-after guest on TV shows that beamed her awesome, lung-busting vocal skills globally. Charice performed on May 23, 2008 at The Event Center at the Mandalay Bay Resort to participate in a one night only live concert tribute to legendary producer David Foster. Charice had the honor of singing Whitney Houston's "I Have Nothing" and "I Will Always Love You" from the hit movie Bodyguard. Whitney and Kevin Costner, the stars of Bodyguard thanked Foster via video for writing and producing the mega hit songs for the movie. Charice then sang "And I Am Telling You" from the movie Dreamgirls. She received roaring standing O's for each one of her performances. Robert Berry "The dividing line"
Robert Berry is one of the most well known musical talents of the San Francisco area. He has been performing for years in venues ranging from the tiniest clubs to the largest stadiums. His fans have followed him through diverse circumstances starting with Hush, a super group comprised of some of the best Bay Area musicians in the 70’s, to his front-man role with “3”, a band put together by the legendary Keith Emerson, together with Carl Palmer in the mid 80’s. Robert has also been involved with another 80’s super group GTR. Together with former YES guitarist Steve Howe (taking the place of none other than ex Genesis Steve Hackett) he wrote and recorded several tracks which sadly have never been officially released by the band which split before the recording of the second album. During the 90’s Berry kept busy composing, arranging, and performing either as a solo artist (he has released 3 solo albums, with “Pilgrimage to a Point” particularly being considered as a true Melodic Prog masterpiece of its era) or as a producer-session player. He also toured for years with the band Ambrosia, where he took the place of another Rock giant, David Pack. In 2008 his band Alliance (together with members of Boston, Sammy Hagar and Night Ranger) released their critically acclaimed 3rd album, “Road To Heaven”. An award winning producer and multi-instrumentalist, Robert Berry has always displayed an uncanny knack for great melodies and exquisite playing either in the classic Progressive Rock style or in a more Melodic Rock oriented musical environment. “The Dividing Line” is Robert Berry’s newest solo effort. Recorded at Soundtek Studios during the year 2008, the album stylistically leans towards timeless Melodic Rock, similar to what Robert has been playing and composing for “3” and GTR during the 80’s. The song themes deal with life, love and human relationships and show the most personal side of Robert Berry’s artistry and vision. All in all an exciting and revealing release which should not be missed by any serious Rock fan. 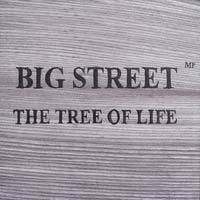 Big Street's second release "The tree of life"! Big street m.p. released their first record "acoustic kindergarten" in february 2007 and have thus far received a lot of excellent feedback for the songs, Stay and Mercy remix (radio edit) from several radio stations in the U.K, Australia, California, The Netherlands and Japan just to mention a few. The style is a mix of acoustic pop, smooth jazz, westcoast music and soul. If you like those styles you will hear their influences. But their debut cd also shows that they have developed their own uniquely recognisable style with blending musicianship. Most of the musicians have studied at the University of Music in Göteborg and been working as part time freelancers. Discover their second album released on October 2008 "The tree of life" now! "First time I learned Jimi Jamison, ex-lead singer of the band Survivor, was working on a new solo album project with Jim Peterik (ex-Survivor, Pride of lion), I was very exited by the news. If my personal tastes in music evolved during the years, listening to less and less "Melodic Rock" records, I still be a SURVIVOR fan over the years. When the band released 2 years ago, their long awaited album "Reach", I jumped on it but was a little disapointed by the content of the cd. I was waiting for something very different, catchy tunes remembering me the good old days of the band with their amazing "Vital signs", "When second count" and "Too hot too sleep" records. "Reach" for sure missed something... and listening to "Crossroads moment", I know the missing piece was the name of Jim Peterik who left the band after the "Too hot to sleep" album. 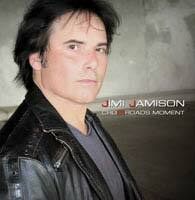 If I was dreaming of a very AOR quality album... Jimi Jamison et Jim Peterik just did it! "Crossroads moment" excels at any levels. Jimi sings at his best and every songs written by Jim Peterik catch your attention with efficient rythms and awesome melodies. Get your copy of "Crossroads moment", you won't be desapointed... just "Amazed"!" WATCH "When Rock Was King" video on Youtube!